Not much would change the fact that America is Iran’s enemy – not even the eagerly awaited 5+1 nuclear deal, a senior Iranian military official has said. Meanwhile Tehran and world powers are edging closer towards a final deal in Vienna. 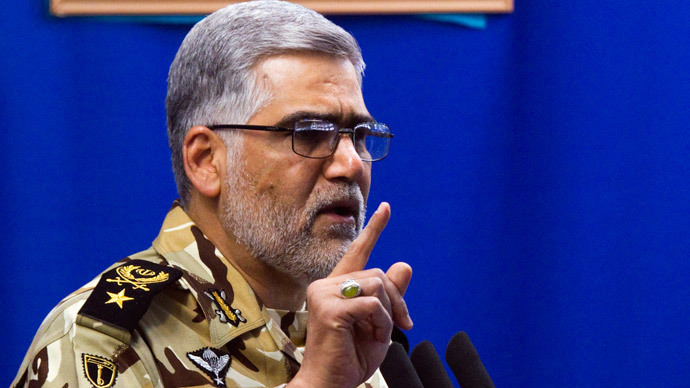 “The US might arrive at some agreements with us within the framework of the Group 5+1, but we should never hold a positive view over the enemy,” Iran’s Fars News Agency quoted the Ground Force Commander Brigadier General Ahmad Raza Pourdastan as saying on Sunday. Meanwhile, the Tuesday deadline to ink the deal draws ever closer. “Our enmity with them is over the principles and is rooted because we are after the truth and nations' freedom, but they seek exploiting nations and putting them in chains,” the Brigadier General continued. Tehran and six powers – Russia, Germany, China, France, the US and Britain – are making their last ditch attempts in Vienna to end the dispute over Iran’s nuclear program, which continues to induce fear in the West about Iran’s nuclear warfare capabilities. Iran, for its part, maintains the program is peaceful. The Islamic Republic is being asked to curtail the program for at least a decade, and is being promised a relaxation of sanctions which have been hitting the economy hard. While the US Secretary of State John Kerry told reporters he still hopes to make the Tuesday deadline, one Iranian official told the semi-official Tasnim agency that the talks could last into Thursday, July 9, The previous deadline of June 30 was missed. Kerry and Iran’s Foreign Minister and top negotiator Javad Zarif were still busy ironing out various differences on Sunday, such as what type of research Iran may pursue if the United Nations lifts the sanctions. Zarif stresses the US can’t do both. “We have heard them many times that they are looking for an agreement…”, he told reporters. According to the Iranian side, a number of issues have already been resolved in Vienna, but a consensus still needs to be reached on other key topics. “There are four or five issues that remain including the important topic of ensuring both sides’ steps correspond to each other and happen at the same time,” Iranian Deputy Foreign Minister Abbas Araqchi was quoted as saying by the ISNA agency. Meanwhile, in the space of this week, Iran has gone ahead and deployed a long-range radar, part of an integrated air defense system the country is setting up. Israel has been the most riled with Iran out of the countries in the region, and Israeli PM Benjamin Netanyahu has even said that a nuclear Iran is a greater threat to the world than ISIS terrorists in Syria and Iraq.